DOE’s earth and environmental system modeling has been developing ice sheet models, coupling them into the full earth system, and doing experiments to see how the ice sheets respond under changing environmental conditions. Much of this work has been done in collaboration with the Advanced Scientific Computing Research (ASCR) Office, under the Scientific Discovery through Advanced Computing (SciDAC) program, which supports partnerships between computational experts and earth system modelers. 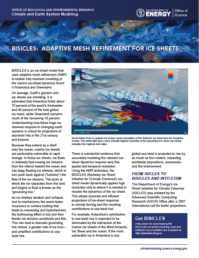 One outcome of this partnership is the BISICLES adaptive mesh refinement (AMR) ice sheet model. AMR places high-resolution gridding in areas where it is needed for accurate solutions, such as where the ice sheets are changing quickly. BISICLES is an important element in the research to understand how the Antarctic Ice Sheet could contribute to sea level rise (SLR). The BISICLES experiment shown here investigates the millennial-scale vulnerability of the Antarctic Ice Sheet (AIS) due solely to the loss of its ice shelves. Starting at the present-day, the AIS evolves for 1000 years, exposing the floating ice shelves to an extreme thinning rate, which results in their complete collapse. The visualizations show the first 500 years of the simulation—after that point, the ice sheet continues to evolve and retreat, but less dramatically. The visualizations show the Antarctic Ice Sheet surface colored in a blue-white colormap that indicates ice speed (blue is faster flow). The bedrock (including sea floor) is shown in a green-brown colormap (green is below sea level, darker green is deeper). The ocean itself is removed for visual clarity. At the start of the visualizations, the edges of the ice shelves are floating at just above sea level. The extremely vulnerable submarine-grounded part of the West Antarctic Ice Sheet (WAIS) is to the left, while the less-vulnerable East Antarctic Ice Sheet (EAIS) is to the right. The camera viewpoint pans over the ice sheet—first zooming in toward the Ross Ice Shelf, then panning in an eastward direction until it finally comes to rest over the Southern Ocean looking across the Antarctic Peninsula and the Weddell Sea. This vantage point makes it easier to see the collapse of the Recovery Glacier (just to the left of the center, above the word “Time” in the time slider) at around year 300 in this simulation. The contribution of the Antarctic Ice Sheet (AIS) remains the largest source of uncertainty in projections of future sea level rise (SLR). Widespread evidence points to the primary climate-driven vulnerability of the AIS being its response to the thinning of its floating ice shelves. Accurately modeling the relevant ice sheet dynamics requires very fine spatial and temporal resolution. Using the AMR technique, the BISICLES (Berkeley Ice Sheet Initiative for CLimate ExtremeS) ice sheet model dynamically applies high resolution only where it is needed to resolve the dynamics of the ice sheet, and places coarser resolution in regions that are not changing rapidly. This allows accurate and efficient projections of ice-sheet response to changing atmospheric and oceanic conditions and the resulting contributions to sea-level rise. These BISICLES simulations were performed at the National Energy Research Scientific Computing Center (NERSC) at Lawrence Berkeley National Laboratory. The black, red and yellow zones in this animation show how the adaptive mesh refinement (AMR) evolves over time. The contribution of the Antarctic Ice Sheet (AIS), comprised of the West Antarctic Ice Sheet (WAIS) and the East Antarctic Ice Sheet (EAIS), remains the largest source of uncertainty in projections of future sea level rise (SLR). The flow of ice from the Antarctic interior to the sea is organized into networks of relatively fast-flowing (1-10 km/year) ice streams moving over bedrock (which is often below sea level) to feed large floating ice shelves. The boundary between grounded ice (ice thick enough to rest on submarine bedrock) and floating ice is known as the grounding line (GL). Finally, ice enters the ocean either via basal melting (due to the presence of relatively warm and saline ocean water reaching the underside of floating ice), surface melting (via hydrofracture-driven crevasses) or through iceberg calving at the edges. In turn, ice shelves affect the feeder ice streams through a “buttressing” effect — pushing back on their feeder streams, slowing them, and reducing their discharge. Thinning and collapse of ice shelves leads to a reduction or elimination of this buttressing effect, leading in turn to acceleration, thinning, and retreat of the ice sheet, particularly via an effect known as the Marine Ice Sheet Instability. Widespread evidence points to the primary climate-driven vulnerability of the AIS being thinning of floating ice shelves resulting either from surface-melt-driven hydrofracture (concurrent water flow and ice-sheet cracking), or the incursion of relatively warm circumpolar deep water (CDW) on to the continental shelf and into the ocean cavities under the ice shelves. The resulting melting, weakening, and potential collapse of the ice shelves, in turn, reduces their ability to exert a buttressing effect on ice upstream. Without this buttressing, the upstream ice flow accelerates, causing thinning, grounding-line retreat, and potentially ice sheet collapse as the marine ice sheet instability takes hold. Next steps for this research include continuing to improve on the BISICLES ice sheet processes and coupling the ice sheet into DOE’s Energy Exascale Earth System Modeling (E3SM), in which ice sheet changes will be investigated under historical and possible future earth system changes.